Interesting for project management, PlanChart2D can accumulate data by ticket "due" date. This way you can show a planned progress. But any other date field is possible and you can combine multiple curves in one chart. So you can create diagrams such as "planned vs. resolved", or include planning baselines into your chart. Several options are available to configure the layout using bar chart, bezier line styles. Also it is possibel to define the x-scale in days, weeks, months and configure the start date. Any project or filter can be used to configure the ticket group taken for chart calculations. A "burndown" option lets you show you planned tickets as feature burndown chart. Visualize planned work (dotted line) against real progress. Each line refers to one date field of your Jira® issues. Monitor and visualize status to your stakeholder using bar graphs. Show progress as burndown chart. Or as total per time interval for in- and out-flow diagrams. Looking for a feature or bugfix? Open a ticket on Bitbucket®. Mirrorlake PivotCharts is a plugin for Alassian® Jira® that can be used in your dashboard to visualize your issue data. You can adjust the chart easily to show exactly the data you need. Just drag&drop field types to the horizontzal or vertical axis containers - the table or chart is rebuilt on the fly. It is very simple to build up great pivot charts: pre-select filter and data fields. Modify the pivot tables adjusting the field container per drag and drop. Click on a cell to open list with related issues. Monitor the status of features, bugs, tasks. 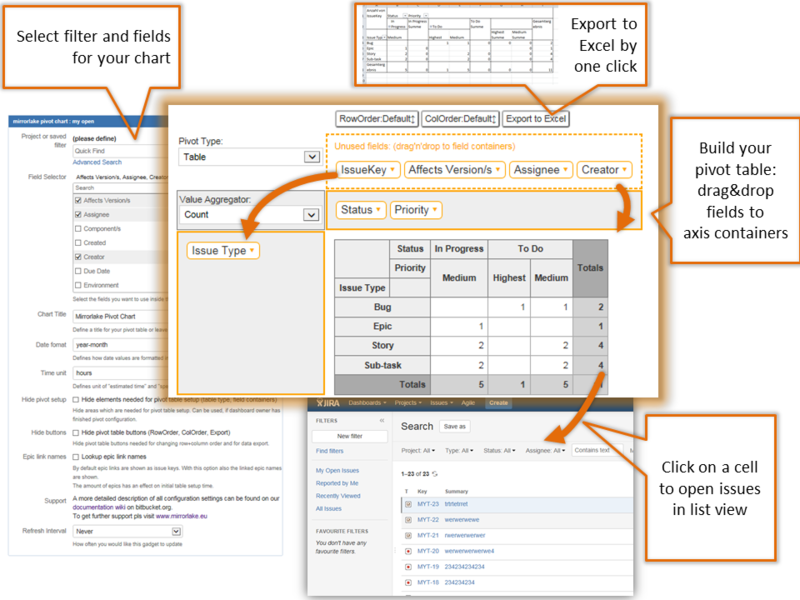 Create the table your need for your report. Or include bar charts directly in your data table, e.g to show the time spent per component. Visualize amount of tickets using heatmaps. Show data in area charts. Or use lines charts to visualize your data. Use the Importer in all your Excel Workbooks: The mirrorlake excel importer is installed as an add-in to Microsoft Excel 2010. You can access Jira® issue import functionaly easily from all your workbooks. The new main functionas showing up in Excel are the Connect Setup, the Jira® Data Import Setup, the data import itself and the Pivot Chart Creator. Connecting Excel with Jira® is easy! The Connection Setup offers a very simple way to connect to your Jira® server. Simply specify your server URL, your user Name and password. Click the "Connect to JIRA" button and you will be connected to your Server to start data import. Select the data you want to import using an easy dialog to select the fields to be imported. Field names are shown in active Jira® language. Enrich your imported data table by adding your own formulas! Using the import setup dialog you can easily define Excel formulas in formularR1C1 style. These formulas will be included in your Jira® data table. Cells will contain data based on your own calculations referencing any other cell of your imported data. Select the filter for your import. Filters for issue import can be defined easily: use a drop down list filled with your favourite filters coming directly from your Jira® server. Or just select to get all tickets of a project. If this is not sufficient, you can define your own JQL statements to filter exatly you needed Jira® issues. Import and update your data table with one click! Once you have done your configuration, you can import your issues with just one click: all data is imported to a Worksheet named "mlimport". If it does not exist, it will be created. Imported data gets excel data name ("mlimportdata"). Use this data name for your diagrams and pivot tables for an effort-less data update. We would like to thank the following partners and customers for their great support. Their contribution significantly helped to improve our products.